In ovis hapalis: piper, ligusticum, nucleos infusos. suffundes mel, acetum, liquamine temperabis. As I discussed in my main post on this Ides of March feast, this dinner presented timing issues. I managed to make a number of dishes ahead, but when you’re steaming mussels and roasting leg of lamb there’s no way to get around a certain amount of time in the kitchen. To minimize my running-around time, I resolved to have a make-ahead appetizer spread. The Romans had a saying, “ab ova usque ad mala” – from eggs to apples, basically the equivalent of the English idiom “from soup to nuts.” I was unable to get this out of my head, so I started hunting through Apicius for egg recipes. I found a couple of sauce formulas for different types of eggs and, because I’m partial to deviled eggs, I decided to work the ingredients from one of these recipes into the egg yolks instead of making a sauce and drizzling it over. This particular sauce – intended for pairing with poached eggs – had nice, fresh-but-strong flavors of the type that work well in deviled eggs. As you can see above, the recipe calls for “soaked nuts.” I might try this in the future with pickled walnuts or something, but for this go-around I went with toasted pine nuts. 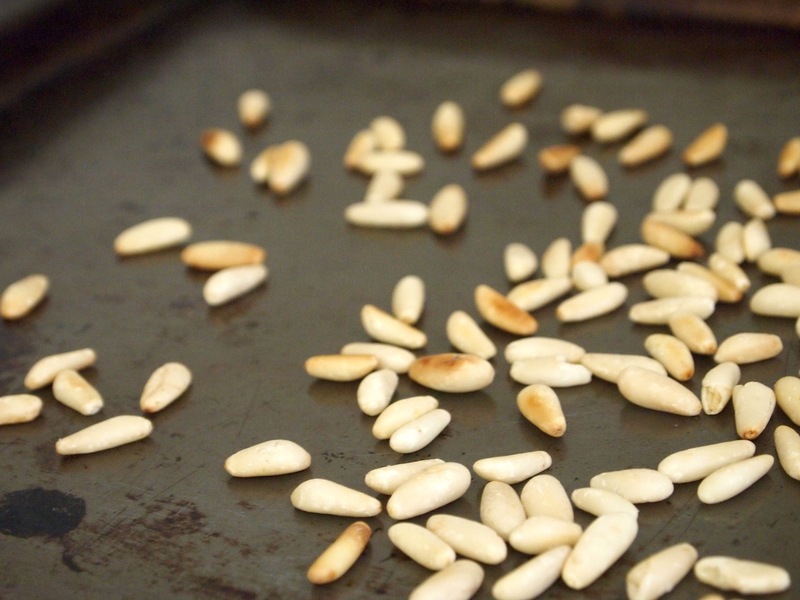 This was pure self indulgence: I adore pine nuts, but they’re a luxury ingredient that I don’t normally keep around the house. With a little help from Foodbuzz, though, I was able to treat myself and my guests to these pretties. It still took forever to peel my eggs and scoop the yolks. But it was worth it. And I took a picture break halfway through. I also used Worcestershire to provide salt in place of fish sauce, and parsley where this recipe called for lovage, since that herb is not widely available in the US. Along with the eggs, I put out simple cheeses and a loaf of bread. The bread, to be honest, was not the most successful loaf I’ve ever made. I got the recipe from The Silver Palate’s New Basics; I’ve actually had really mixed luck with their baked goods. As you can see, this loaf didn’t rise fully; it came out very dense. It still tasted good, though, and as one of my friends pointed out, the density was probably quite authentic for Roman times. 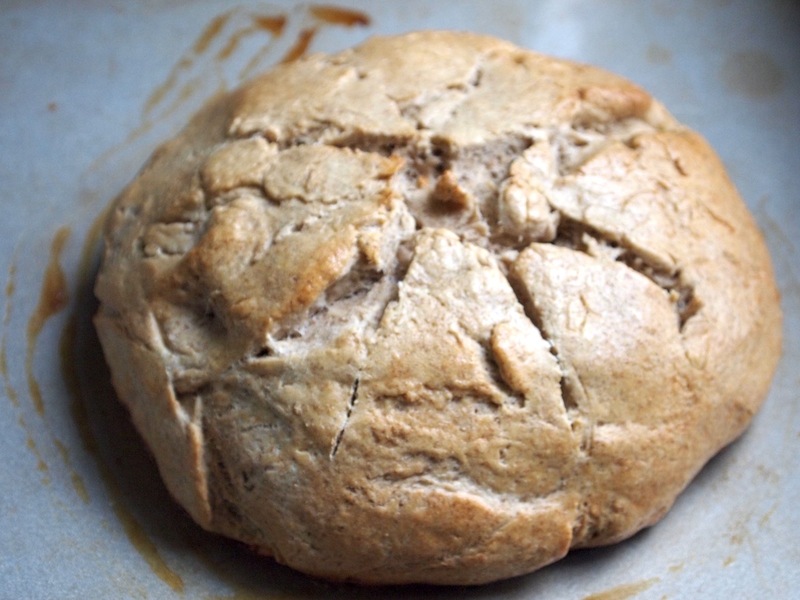 The rye-white flour mix – very Roman – had a nice flavor, which went well with goat and Piave cheeses. Now, enjoy this egg recipe, and keep checking back this week for the other courses! 1. 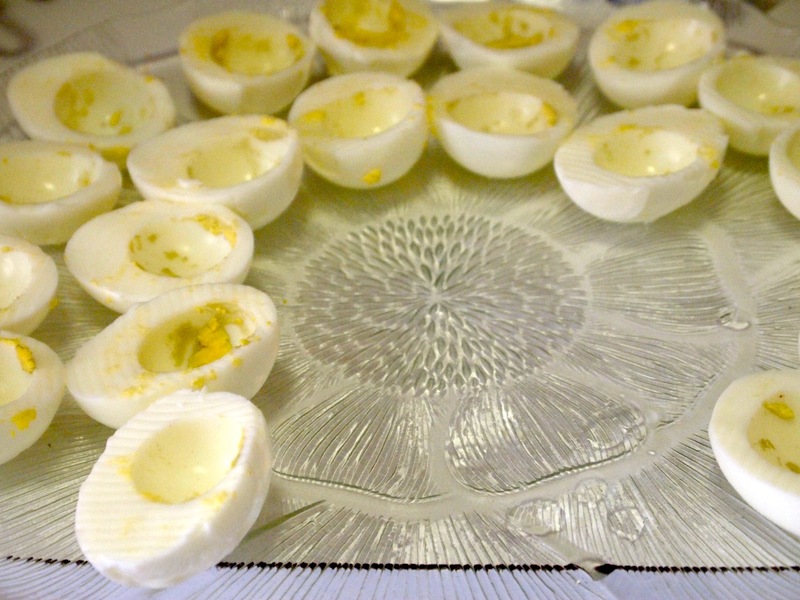 Cut the eggs in half lengthwise, pop the yolks out into a medium bowl, and reserve the whites. 2. Mash the yolks together with the parsley, honey, vinegar, nuts, and Worcestershire. Add 3 tablespoons of oil, and gradually pour enough of the last spoon in to form a nice paste. 3. Press the yolk paste into the hollows in the egg whites, top with a couple of whole pinenuts, and serve. I’ll be honest — I used to hate deviled eggs. However, I recently (with in the past few years) became a convert and now I love them. I’m diggin’ the pine nuts on top of yours. I’ll try that next. Love how a few simple changes make such elegant deviled eggs! They look marvelous! Ooohhh, I love deviled eggs! I never make them because I don’t want to eat all of them myself 🙂 Maybe I can make a small batch of these. I love the sound of these eggs! Nutty goodness and deviled eggs! YUM! Oooh … the eggs look so pretty! And I’m a fan of pine nuts too! Gotta do this soon. Thanks! Yummy! Definitely a fan of deviled eggs.